Language-based learning disability (LBLD) refers to a spectrum of difficulties related to the understanding and use of spoken and written language. LBLD is a common cause of students' academic struggles because weak language skills impede comprehension and communication, which are the basis for most school activity. Like all learning disabilities, LBLD results from a combination of neurobiological differences (variations in the way an individual's brain functions) and environmental factors (e.g., the learning setting, the type of instruction).The key to supporting students with LBLD is knowing how to adjust curriculum and instruction to ensure they develop proficient language and literacy skills. Most individuals with LBLD need instruction that is specialized, explicit, structured, and multisensory, as well as ongoing, guided practice aimed at remediating their specific areas of weakness. 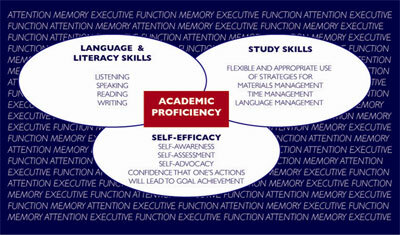 Academic proficiency develops in relation to students' increasing skills and abilities. Its three interrelated elements, shown in the figure below, are coordinated by the individual's executive function. Executive function enables students to maintain focus, progress, and motivation; make connections with existing knowledge; recognize when comprehension falters; and apply strategies to modulate frustration and resolve lapses in understanding. Language and literacy skills include listening, speaking, reading and writing. Study skills include flexible and appropriate use of strategies for managing materials, time, and language. Self-efficacy (the belief that one's actions are related to outcomes) includes skills in self-awareness, self-assessment, and self-advocacy. All of these skills are coordinated by executive function, which is the brain's super-manager and empowers students to set goals, marshal the various internal and external resources needed to meet them, and make adjustments to ensure accomplishment. Most students with LBLD develop academic proficiency only when they are taught skills within a supportive environment of curriculum and instruction designed to meet their specific needs. When teachers know how to celebrate students' strong skills and remediate their weak ones using skills-based curriculum and instruction, students' lives can change. The first step to empowering students with LBLD is to understand how and when LBLD impacts their school experience and why language-based teaching works. Children naturally develop skills at their own pace, and most students have difficulty learning from time to time. To assess whether a student's performance in a skill area warrants concern, we must take into account typical development patterns. We expect preschool children to have difficulty tying their shoes, cutting out pictures from magazines, adding numbers, and writing neatly. Middle school students should be able to do these things quite easily. It is persistent difficulty in one or more skill areas that requires investigation. Even so, the level of struggle that calls for investigation does not emerge at a predictable time in child development; rather, difficulties may appear at any time from preschool through adulthood. Sometimes difficulties emerge because the compensatory strategies students used in the past stop working. Many bright students with learning disabilities go to great lengths to mask their struggles. Their intelligence enables them to compensate for lack of skill in one area with talents in other areas. A student might be a terrific talker and demonstrate solid knowledge in class discussions. Why would the teacher guess this student cannot read fluently? While students' capacity to adapt is admirable, the cost is high. Too often, they enter middle and high school with elementary-level reading and writing skills. The fact is, if schools took the time to administer literacy screening assessments to all students at least once each year, those at risk could be identified, provided with remedial instruction, and offered accommodations to help them succeed in class. Many screening assessments are commercially available, and easy to administer and score. Curriculum-based measurement (CBM) can also be used to screen students. Excellent free resources for CBM are available online at Intervention Central. In addition to screenings, students offer arch source of information about their learning strengths and struggles — if we take the time to ask. The learning questionnaires at the end of this chapter show one example of how to ask students to self-report. Students have unique learning profiles that reflect their educational experience, their learning, thinking, and personality styles, and their particular areas of need for language acquisition and use. All students who struggle in school — particularly those with LBLD — benefit from structured, multisensory, skills-based instruction. Each requires individualized instruction targeted at his or her specific needs. The student profiles in Language-Based Learning Disabilities are included to encourage teachers' thinking about students in their own classes. Who among my students is not meeting expectations? Why might this student be struggling? What is preventing this student from learning effectively? What steps have I taken to support these students? Patricia W. Newhall is Associate Director of Landmark School Outreach Program. The Outreach Program offers language-based consulting, program design, seminars, publications, and free e-resources that aim to empower students with learning differences through their teachers. For more information about language-based learning disabilities and language-based teaching, please visit the Landmark School Outreach Program website. Excerpted with permission from Landmark School Outreach Program from Newhall, P. W. (2012). Language-based learning disabilities. In P. W. Newhall (Ed. ), Language-based teaching series. Prides Crossing, MA: Landmark School Outreach Program.